Led by Rowan Barrett, Canada Research Chair in Biodiversity Science at McGill University and Hopi Hoekstra, Professor of Organismic and Evolutionary Biology and Molecular and Cellular Biology, a team of international researchers conducted a years-long study to track how light and dark-colored mice survived in light- and dark-colored habitats. The results not only confirmed the intuition that light-colored mice survive better in light-colored habitats, and vice versa for dark-colored mice, but also allowed researchers to pinpoint a mutation that affects pigmentation, and understand how it produced a novel coat color. The study is published in Science. “This project has been many years in the making, and part of the inspiration for it came from the experimental evolution studies people have been doing for many years now using microbes in the lab,” Hoekstra said. “The idea has been that you start with a particular population, genotype it, and then give it environmental challenges and watch how the population evolves. Then you genotype it at the end and you can see, at the genetic level, what changes. To do it, then-postdoctoral fellow Barrett and colleagues traveled to the tiny town of Valentine, Nebraska in order to take advantage of an important natural habitat – the Sand Hills. As early as the 1930s, Hoekstra said, it had been observed that mice living in the sand hills – a large area of contiguous sand dunes with sandy, light-colored soil – are lighter in color than those living in the surrounding areas with dark, loamy soil. To understand what underlies those differences, Hoekstra, Barrett and colleagues came up with an ambitious plan to build a series of eight enclosures – each 2,500-meters-square, or just over a half-acre – four on the light-colored sand hills and four on the darker soil. They then “seeded” each enclosure with 100 mice – half trapped from the sand hills and half trapped from the surrounding dark soil – after marking each with a tiny, embedded RFID tag and taking the very tip of their tails for genetic sequencing. Three months later, researchers returned to catch the mice and identify the survivors. That phenotype information, however, was only part of the story – the researchers also wanted to understand whether there may be genetic differences in the surviving populations. The team chose to focus on one – a protein coding change that resulted in the deletion of a single amino acid from the resultant protein – which was associated with a shift toward a lighter coat color. Biochemical analyses done with Jonathan Duke-Cohan at Harvard Medical School showed that the mutation affected the protein’s binding properties, and further tests using gene-editing techniques confirmed that this single mutation resulted in visibly lighter-colored mice. 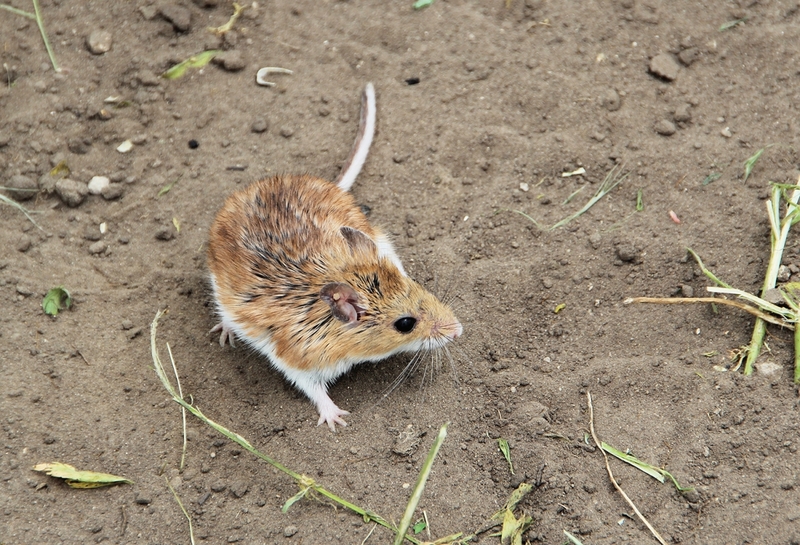 Going forward, Hoekstra said, there are two main paths for researchers to pursue – further investigating whether there may be other genetic differences that help mice exist either on or off the sand hills, and the other investigating change over multiple generations. This study was supported with funding from the Natural Sciences and Engineering Research Council of Canada, the Swiss National Science Foundation, the National Geographic Society, the Harvard Museum of Comparative Zoology, and the Howard Hughes Medical Institute.